The energy on the second day at Lashkara, the annual fest of SGTB Khalsa College, ran high as the day flagged off with the street play event, called Pratyaksh. 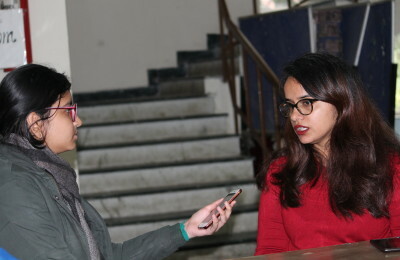 The event was held at the Nukkad right at the centre of the college campus. For the first time, Pratyaksh was a non-competitive event with the aim of eliminating the rat race from amongst the teams, and promoting a greater understanding of the themes that each of the play represented. A total of eight teams, including Hans Raj College, Indraprastha College for Women, Lady Shri Ram College and others. The judge for the event was Mr. Ulas Samrath, an alumnus of the SGTB Khalsa College and the former president of Ankur, the theatre society of SGTB Khalsa College. Swarang, the music society of the college also hosted their annual fest under the name, Syncopation. The fest saw Western Solo Singing competition and the Western Duo and Trio Singing competition on day 2 at Lashkara. The Western Solo Singing competition witnessed participation from almost 15 students, among which Srimayi Laddagiri of Dyal Singh College (M) bagged the first position followed by Megha Khandelwal of Rajdhani College, and Samarth Mehta of SGTB Khalsa College, at the 2nd and 3rd positions, respectively. This was followed by the Western Duo and Trio Singing competition. The competition, which took place at the main stage in the sports ground, saw teams from Sri Venkateswara College and GTBIT college sharing the first position, followed by another team from Sri Venkateswara College.